Europe Struggles with Influx of Iraqi Refugees After four years of chaos and violence, nearly two million Iraqis remain outside their country, most in neighboring countries such as Jordan and Syria. In Europe, Iraqi applications for asylum have doubled over the past three years. Few European countries are offering much refuge, with one exception: Sweden. 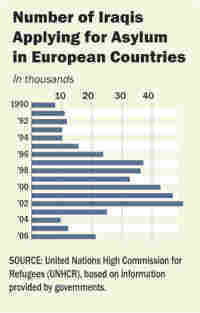 A look at the percentage of Iraqi refugees granted protection, country-by-country, in Europe, and a chart of the number of Iraqi refugees to Europe, year-by-year, since 1990. After four years of chaos and violence, nearly two million Iraqis remain outside their country, according to the UN agency for refugees. Most are overwhelming neighboring countries, particularly Jordan and Syria. 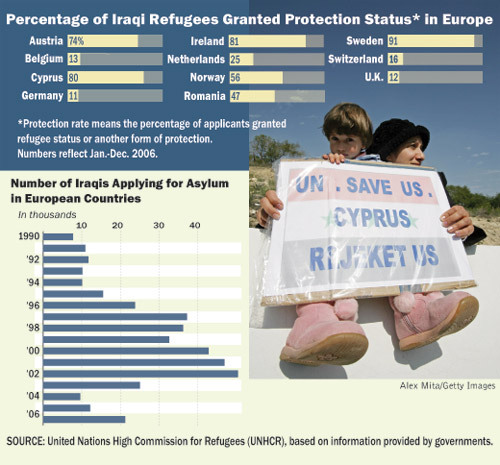 In Europe, Iraqi applications for asylum have doubled over the past three years. But few European countries are offering much refuge, with one exception: Sweden. In 2006, almost 9,000 Iraqis applied for asylum in Sweden — triple what the country was expecting, and more than 40 percent of all Iraqi refugee claims in Europe. 50-year-old Laura paid a smuggler about $30,000 to get her and two daughters to Sweden. She arrived here three months ago. The turning point for Laura was when her son was kidnapped. "That was the day I decided to leave," says Laura, who is afraid to use her real name because her husband and two children are still trying to leave Iraq. Her son was released after three days and a $25,000 ransom. Laura is a Christian and she blames Muslims for the chaos in her home country. But Iraqi Muslims are also seeking refuge in Sweden. Reisan Abbas, 24, is Shia, and was an engineering student in Baghdad. "You can be killed every moment without any reason," Abbas says. "At the university, they can enter your department and just kill you." Ahlam Hamid Abbas is afraid she'll be killed in her home in Baghdad's Amariya neighborhood. The middle-aged Sunni woman smiles and nods when introduced — and she cries when she talks about Iraq. "It's impossible in Iraq," she says. "It's miserable. Bombs and explosions. No electricity, no gas. This never happened before the Americans came. Only after. Killing, bombing, explosions, no security no economy. It's not possible to live. Nobody knows what to do." Her relatives ignore her outburst as if they know it by heart. They keep sipping tea and serving cake in the small living room in a rowhouse north of Stockholm. Like many recent arrivals, Abbas and her 88-year-old mother came to Sweden because other close family members already live here. Tens of thousands of Iraqis sought refuge in Sweden during Saddam Hussein's rule. But Sweden also handles Iraqi asylum claims differently than other European countries. "I would say about 90 percent of Iraqis are staying at this time," says Fredrik Beijer, director of Sweden's asylum processing. He says that even Iraqis with weak individual persecution claims now often get residence permits with full rights to work, and welfare for a practical reason. Sweden won't send them back and, figuring they'll be in the country for a while, would rather try to integrate them. "When you see you are not being able to send back this person in a foreseeable time, you can say that they are going to get connected to Sweden," Beijer says. "If you can say that from the beginning, then you have the possibility to stay." But with such a disproportionately high number of claims, Sweden is pushing other European countries to do more. Tobias Billström, Sweden's migration minister, wants to see European countries receive and accept more people. That would be a big change for places like Germany, which accepted about 10 percent of Iraqi asylum claims last year. It has also started taking back asylum that it granted to Iraqi refugees in the 1990s. About 18,000 Iraqis — one-third of those in Germany — have lost that protection since revocations started three years ago. Immigration lawyer Reinhard Marx has seen plenty of clients bring in notices from the government explaining the reasons. "The philosophy behind this is very simple," Marx says. "Mr Saddam Hussein has been defeated so there is no persecutor anymore." Aso Amin, a former Kurdish peshmerga soldier who fled to Germany in 1997 finds that absurd. "There used to be only one Saddam. Now there are a thousand — from the Shia, from the Arabs, al-Qaida, terrorists," Amin says. "You used to know who your enemy was. It's not like that any more." Amin has what's called a toleration permit to stay in Germany. That means work options and social welfare are sharply restricted while Germany figures out if its possible to send thousands of people back to Iraq. Refugee advocates say this throws people into limbo. But Interior Ministry official Peter Altmaier says it is an important part of the concept of political asylum. "Such a right of asylum is not indefinite. It is not forever," Altmaier says. "It is just meant for the period where the person concerned is in concrete danger and risk." Altmaier says that Germany has deported three Iraqis since the fall of Saddam Hussein. Britain has sent back the most — 85. The most recent group was deported last month. The British government says all have come from and were returned to the northern, Kurdish-controlled area of Iraq, which Britain feels is sufficiently stable. Still, refugee advocate Bjarte Vandvik of the European Council on Refugees and Exiles says that even symbolic returns send the wrong message. "It's a double standard where, OK, to help them down there and even to the extent of sending soldiers. But when they come here and say, 'We're still scared, we're afraid for our lives and our children,' then sorry, we don't, we can't help you." Sweden's migration minister Tobias Billström is trying to convince other European countries that even if they don't take in more people, they must send money to Syria and Jordan to help with the hundreds of thousands of Iraqis there. "If they were to be destabilized – it would prove to be very, very bad indeed, not just for the region – but also for Europe. Because then this enormous amount of people would move westward," Billstrom says. That may be a good argument for Germany's Altmaier. "I personally still think we should try to solve this refugee crisis in the region concerned, rather than inviting all these people to Europe," Altmaier says. "We think it is also in the interests of the person concerned to stay in the region where they are familiar with, where they would not lose their culture, and where they could return much easier to their country of origin as soon as the situation has improved." The United States has agreed to accept 7,000 Iraqi refugees this year, after admitting fewer than 500 over the past three years. The United States is the biggest contributor so far to a U.N. fund set up to help Iraqi refugees in the Middle East. So far, the biggest European contributor to that fund is Sweden.